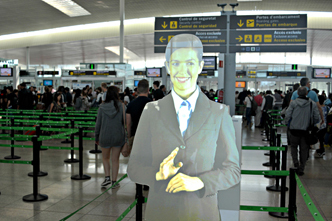 Using BrightSign’s HD1023 player, passengers to the busy El Prat Airport are given a virtual greeting to improve their journey.Using the latest technology, an optical illusion of a real person has been created at the security gates at Terminal T1 and T2B, that informs passengers of the necessary steps to access and pass through the security checkpoint ahead. Detailed information, given by the assistant, ensures passengers arrive at the checkpoint with all their belongings ready for inspection. Security messages are given by the virtual assistant in five languages: Catalán, Castilian Spanish, English, Russian and Chinese. Part of BrightSign’s innovative Series 3 product line, the HD1023 is an expanded I/O player ideal for mainstream Full HD and HTML5 applications that require high reliability and ease of use. It offers H.265 decoding, hardware-accelerated HTML5 engine and 1080p60 video decode, along with BrightSign’s highly reliable media-handling platform and signature ease of use. All Series 3 HD models support Gigabit Ethernet, as well as robust interactive controls and dynamic live content features.